This month State Street demonstrates that buying stocks based on valuation has usually worked - but not in the current calendar year. Does that mean growth is in a bubble? Others ask if there are bubbles in cannabis or in the bond market. Fund managers are fearing trade wars. But Morgan Stanley shows that pulling money in and out of the market is often a flawed approach. Meanwhile, fund services group Mainstream (ASX code: MAI) and drug prescription adherence tech play Medadvisor (ASX code: MDR) chart out some of their target markets (equitable Investors Dragonfly Fund has positions in both companies). Share prices should be reflective of future expectations rather than the past. Earnings reports provide vital new information to tune expectations but on their own shouldn't dictate share prices. 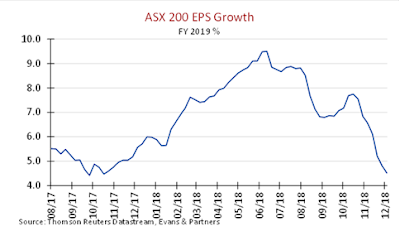 That is why, with the ASX reporting season now at an end, we look at changes in analysts' earnings expectations as an indicator of the strength of the season. We see these changes as far more instructive than simply whether the reported financials were better or worse than analysts' targets. Analysts have been forecasting earnings on just under 500 ASX listed companies. In aggregate we didn't find much to get excited about. Over the course of the month of August, the average change in the consensus earnings per share forecast for fiscal 2019 was -1.76% - or -0.54% if the average is weighted by market cap. Apparently, Confucius didn’t say “One Picture Worth Ten Thousand Words” after all. It was an advertisement in in a 1920s trade journal for the use of images in advertisements on the sides of streetcars. Even without the credibility of Confucius behind it, we think this saying has merit. Starting this month, each month we will share a few charts or images we consider noteworthy. This month we kick off with charts covering a reversal in fund flows in Australia, metrics on two companies in the Dragonfly Fund portfolio, Citigroup's neat illustration of market liquidity, an illustration of the power of price-to-earnings multiple expansion and Star Wars viewed through the eyes of a volatility trader. Castrol always told us that "oils ain't oils" and Big Un has now confirmed that cash flows ain't cash flows. The failed online video review business finally released its accounts for the six months ended December 31 and they showed operating cash flows were sharply negative to the tune of $9.4m (Figure 1, below). That's completely at odds with the positive $16.8m operating cashflow reported for the same period ("Year to date" column in Figure 2, below) when Big Un announced them six months ago. Figure 1: Big Un's net cash used in operating activities as reported on its newly released half year accounts. Figure 2: Big Un's net cash used in operating activities as reported in its quarterly cash flow statemnet released in January 2018. Large cap Australian stocks appear at first glance to have held up better than global benchmarks in the latter half of the financial year. While the S&P/ASX 200 has risen to its highest levels since the GFC, globally the Wall Street Journal recently published a chart illustrating that there had been a nearly $US10 trillion decline in world exchange market capitalisation since a peak in January 2018. The Russell 3000, a broad index of US stocks, peaked on January 31 and has pulled back ~4.5% since then. But once you consider exchange rate movements, you can argue that Australian equities haven’t performed so well. Figure 1 shows that from a US dollar perspective, Australian large cap equities have declined since late January. Note the AUD peaked at $US0.81 in Jan and is now ~ $US0.74. Earlier in the year we reviewed weekly returns for the S&P/ASX Small Industrials Accumulation Index between January 2013 and January 2018. In the context of the previous blog entry, Tax Loss Selling, we went back to take a second look at that analysis (when we originally did these numbers, we were looking for any sign of the "January Effect" - it is often said that small caps generate their excess return for the calendar year in that one month but we don't see convincing evidence that this holds on the ASX). This data shows the first week of June as typically the worst of the calendar year over the past five years and subsequent weeks in June also being lackluster. 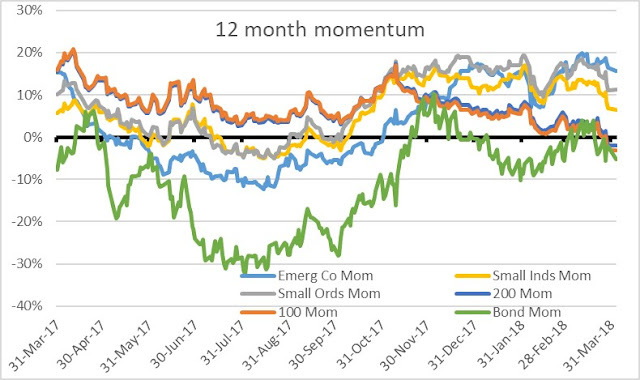 Consistent with the chart from Wilsons in the previous blog entry, July in contrast has typically started off strongly and continued to power on. These aren't projections - history may rhyme but doesn't precisely repeat. June is typically a volatile month for the Australian sharemarket as investors sell poorly performed investments in order to generate losses that offset gains realised throughout the financial year. This trend is thought to impact on smaller stocks the most. The strength of the June trend is highlighted in Figure 1, from Wilsons. What Figure 1 doesn't show is that after tax loss selling is largely executed, the back end of June can benefit from less selling pressure. Equitable Investors' review of the numbers suggests this year's tax-loss driven activity has probably been greater than in the prior year. Focusing on the smaller stocks, we identified 205 industrial "tax loss" stocks with market caps between $20m and $200m that had generated negative returns in the first 11 months of the financial year. 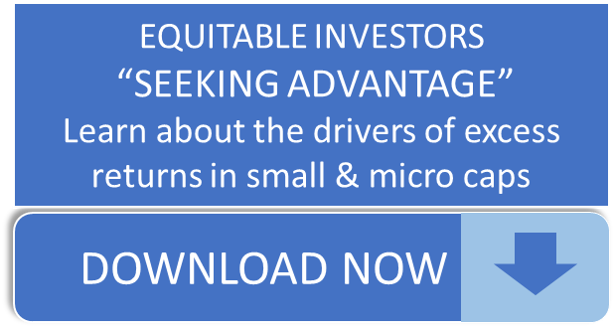 Industrial stocks, within their broader definition (ie stocks that aren't miners or explorers), are what the Equitable Investors Dragonfly Fund is focused on. We ran some numbers for a presentation on the Fund and pulled together the following two charts on the historical performance of ASX industrials. the distribution of individual stock returns has been favourable but you've still got to carefully avoid a reasonable number of booby traps;the smallest stocks have been, consistent with our expectation, the source of the greatest performance - on average and in terms of the best performed stocks; but mid-caps have also been a sweet spot. Things are certainly getting more interesting in equity markets when an Aussie can go to sleep on Wednesday night with the Dow Jones Industrial Average (a very poorly constructed index) dropping as much as 510 points only to wake up on Thursday and find it has recovered 741 points. Here's some charts we review when checking the market's temperature. Large cap indices are now down over the past 12 months, while small cap indices have also been in decline. The ASX version of the VIX (an index that calculates the volatility implied by the pricing of index options by investors hedging or speculating on stocks) rallied late in March.